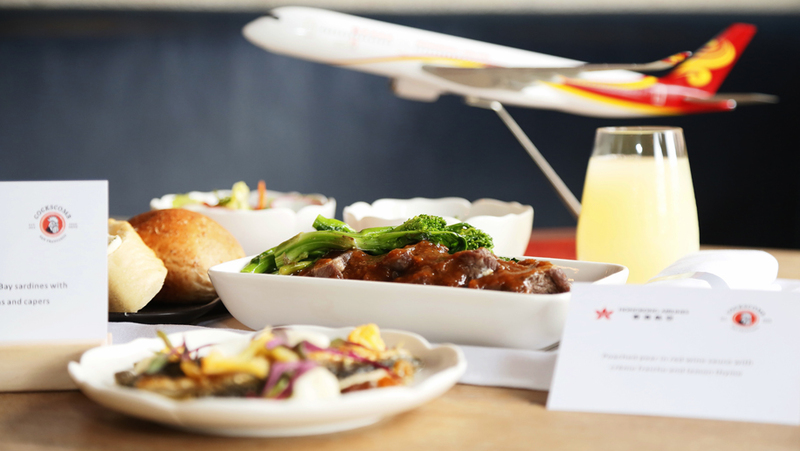 Hong Kong Airlines has partnered with San Francisco-based celebrity chef, Chris Cosentino, to develop a new menu ahead of the launch of its new flights to the city this Sunday. Cosentino, who runs the restaurant Cockscomb and was a winner on Top Chef Masters, has developed a business class menu for the airline’s San Francisco route that he describes as “big in flavour, rich in texture”. Ginger dates and toffee cake topped with whipped cream and sugar dates. Initially the menu will only be available on flights departing San Francisco, though Hong Kong Airlines has said it plans to expand this to its flights out of Los Angeles, which it launched in December, later in the year. Business Traveller reviewed Hong Kong Airlines’ business class cabin on board its new Airbus A350 aircraft on its Hong Kong-Los Angeles route. The new menu differs from the one unveiled by the airline last month, which has been developed by Hong Kong-based chef Gabriel Choy. This menu will be served on all flights departing Hong Kong, including those to San Francisco. This isn’t the first time the carrier has introduced new menus developed by chefs based in locations it has recently begun serving. Before the launch of its Hong Kong-Vancouver service on June 30 last year – its first to North America – the airline partnered with Vancouver-based chefs Sam Leung and Garley Leung from Dynasty Seafood Restaurant to develop a new business class menu specifically for the route. Hong Kong Airlines also has announced its intention to launch non-stop flights to New York this year, along with London in the future.